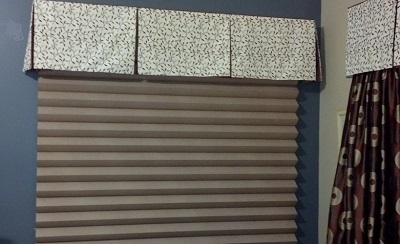 Why Choose Blinds and Shades as Window Covering - Sew What? Sew Anything! Why would you want to cover windows with blinds and shades? It is great to look outside windows for a view that connects us to nature. The sunlight warms us… sometimes too much. We all love sunny days, however, sunlight can be damaging. Your soft goods, your chairs, sofa and even the carpet can fade with too much sunlight. It may also be hard to work on your computer or watch television in a room flooded by sunlight. I have several different types of shades in my home. Each room has a different look based on how I use my windows. In my family room I have a two large windows that overlook a backyard pond. I don’t like to cover them up. However, the spring and summer morning sun is so hot I have to pull the shades to keep the room cool. In the winter it may be so cold that I have keep the shades down to keep the room warm. These are the new this year, Prominence(TM) Roman Pleat Shades from Kathy Ireland. These are great shades for the large window.. They also give me privacy when I want to “shut the world out.” In my kitchen on the over the sink window I have a solar shade product. This allows me to look out and see the world yet shades the room from the sun and the heat. In my bedrooms I have honeycomb shades that are great for privacy and light control. Having your windows evaluated for the right type of shade or covering is a great first step. Do you need full coverage, for privacy? How about a shade that blocks sunlight and and holds in heat yet allows you to see through like a solar shade. How about a wooden shade that will add style to your window? Do you have hard to fit windows with arches or angles or a trapezoid shaped window? Or, perhaps a window door that needs a cut-out for the handle. All these windows can be fitted for a blind or shade. Having a professional that knows the benefits of each shade will help you make the best choice for your home. I love your new website. I love how you were able to showcase your projects, they are absolutely beautiful! It truly takes talent to sew the way you do. Thank you for visiting my website and for your comments.